It does a good job in its price bracket. It isn't a high-end property. 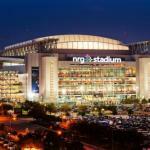 It is convenient if your activities are at Reliant Center, the MD Anderson Medical Complex or Rice University. The restaurant isn't anything special, and the lounge is rarely open. The staff is generally willing to get anything for you that you need, and is friendly and helpful. The pool wasn't well kept, the bar/lounge was rarely open. Good price. Convenient to medical center. Not a place I would want to bring my family, but adequate for a short stay. Somewhat old and run down. Crowne Plaza Houston is a full service hotel formerly known as Houston Grand Plaza Hotel. Just recently renovated, the property underwent a series of improvements giving the whole place a fresh look. In its well-appointed guestrooms and suites, hotel guests enjoy high speed internet access at no extra costs and the daily paper is delivered to every occupied room each morning. The favorite lodging among business travelers, this Texan hotel boasts a 24-hour business center complete with all the equipment businessmen and women need. Apart from business travelers, the hotels patrons also include families thanks to its family-friendly amenities and services. Rooms boast plush beddings and ultra-comfortable beds. The private baths are equipped with complimentary bath products and extremely soft towels. Other amenities include remote control television sets with cable, air conditioning systems, telephone lines and other basics. The Crown Plaza Houston Hotel has a total of 60, 000 square feet of sophisticated meeting space, a 24-hour business facility, a 24-hour fitness center, a beauty salon and an ATM onsite. Guest parking in the property is complimentary and you do not have to worry about the parking spaces because there is enough for all hotel guests. For those who brought a lot of bags, baggage storage is available and you can request for a safety deposit box too. If you feel like touring Houston, the hotel offers a complimentary shuttle service going to areas within a 3 mile radius. If the shuttle cannot reach the place you want to go to, you can always ask help from the concierge. Other hotel services include laundry, valet and room service. The place also has a gift shop, 2 onsite restaurants, 2 outdoor pools and a hot tub. The Crowne Plaza Houston Hotel is a great alternative to economy class hotels. This newly renovated property provides an impressive set of amenities intertwined with great service without you have to spend so much. Dining in the hotel is a delight too. Breakfast, dinner and lunch at Stetsons is a wonderful experience since they serve international delights and many local favorites. For those who would like to have a few mugs of beer or a few cocktails, Cattlemans Bar & Grill is the place to be. 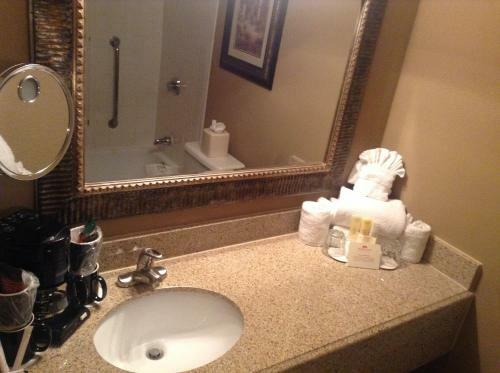 The rooms and suites in this Houston hotel are well-appointed and very clean. This place is highly recommended.